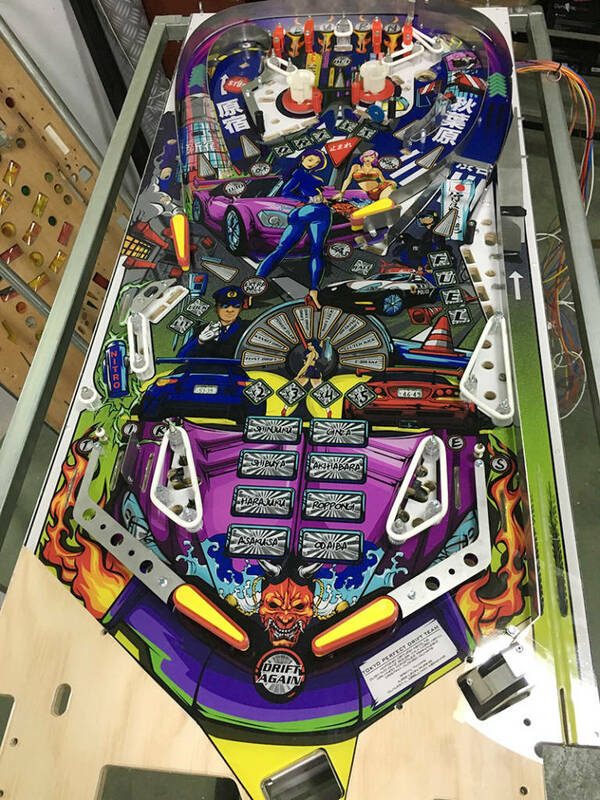 A new pinball from Spanish producers Quetzal Pinball and STR Pinball has been previewed at the Arcade Museum in Petrer in Spain. 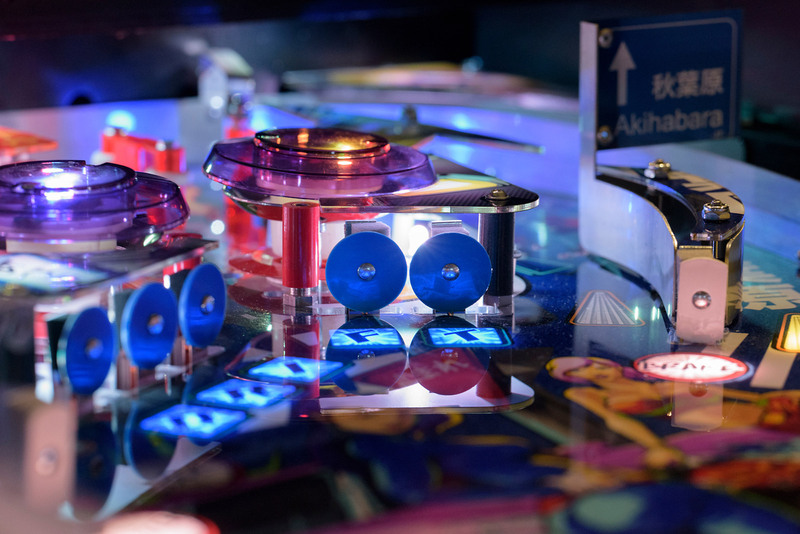 It is a single-level, four-flipper game, with five balls and a fast and furious style of gameplay, a custom electronics boardset and full RGB lighting. Tokyo Perfect Drift is a collaboration between Antonio Ortuño from Quetzal Pinball and Orlando and Cristina from STR Pinball who built several of Quetzal Pinball’s previous title, Captain Nemo Dives Again, and who assembled the prototype of this new game along with providing much of the troubleshooting. 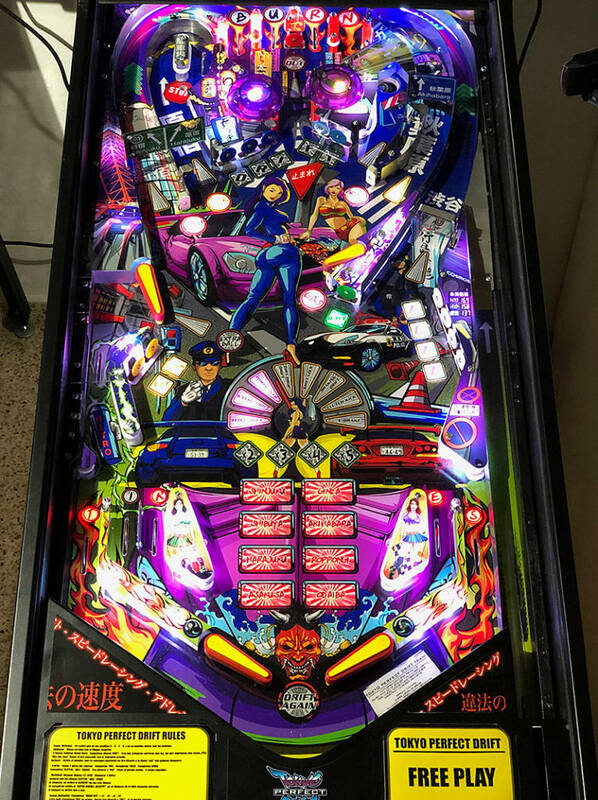 Antonio spoke to Pinball News about his new title and how it was developed. He told us how, having given up his job as a computer programmer three years ago to concentrate on building pinballs, he was working on developing his follow-up to Captain Nemo. 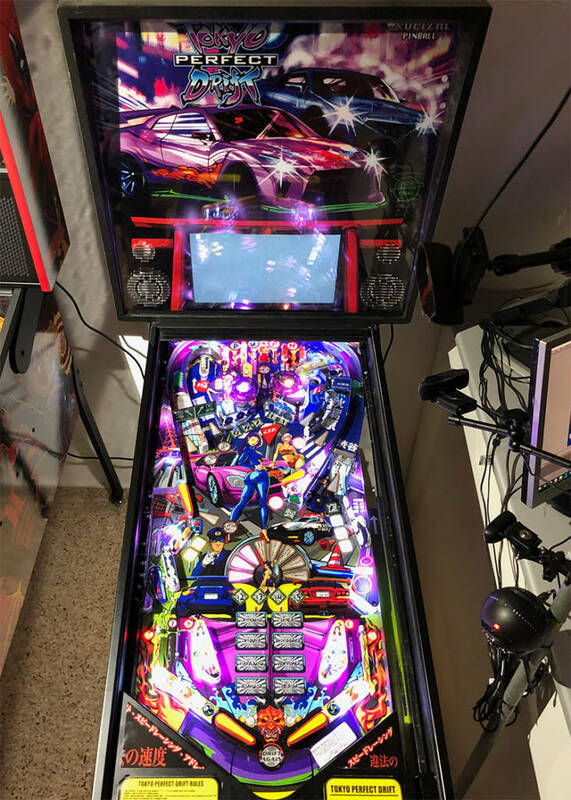 However, earlier this year he realised the game wouldn’t be ready before the end of 2018 and how, since pinball design was now his main source of income, he needed another paying project. 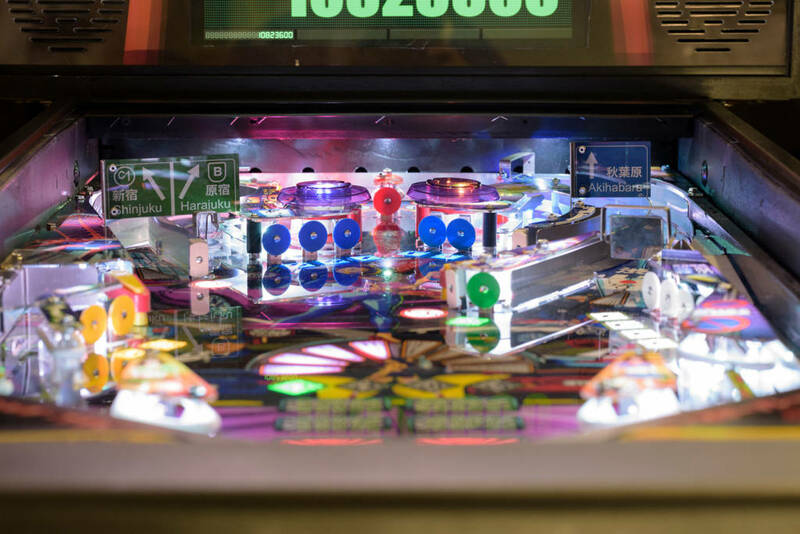 So, at the end of July he spoke to Orlando and Cristina from STR Pinball about developing a simpler, single-level pinball game which they would assemble. He also got the graphic designer from Captain Nemo, Gustavo Díaz a.k.a. Lord Hiryu, on board to create the artwork, despite his love of games with ramps. 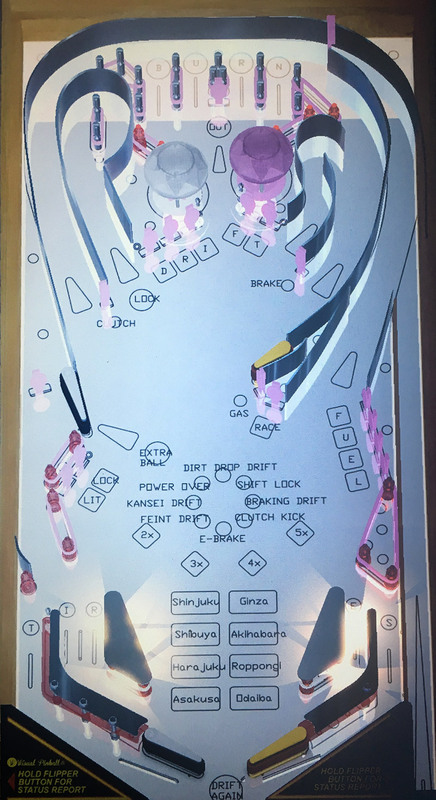 Although he usually takes some time to create his playfields, Antonio created the Tokyo Perfect Drift design in a weekend at the start of August. He chose this time because many manufacturing companies are closed during August for their summer holidays, meaning he would be able to start ordering parts soon after they returned to work. 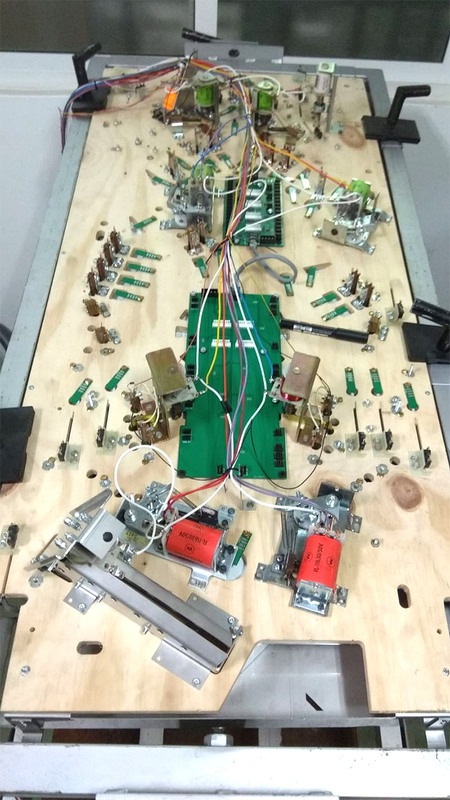 His intention was to design a single-level playfield which wouldn’t need any ramps since it would have a multitude of shots on the main level. He wanted the feel of an upper playfield area, but for it to be on the same level as the rest of the game and open enough to be able to be shot in several ways. Although he doesn’t usually work this way, Antonio simulated the game on a PC to help speed-up development. 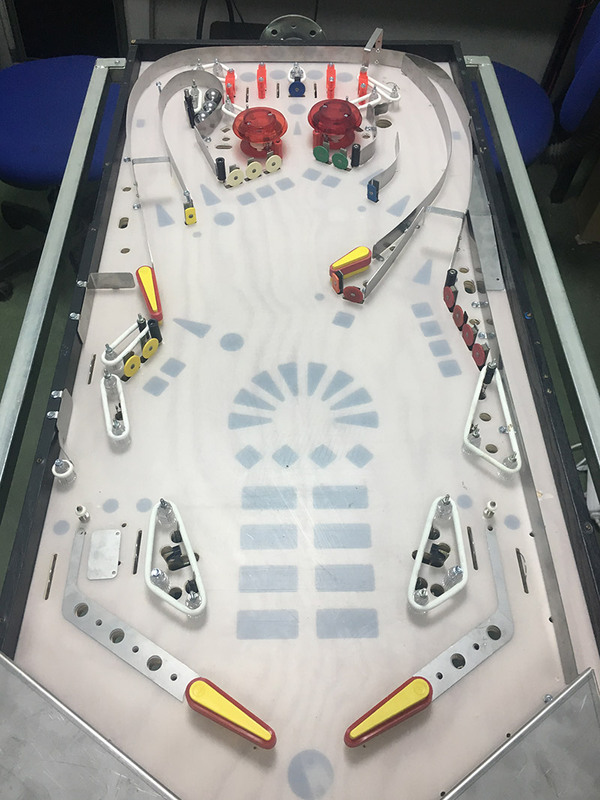 Once the playfield design was produced and the simulation complete, the project was put on hold until September when the summer holidays were over and manufacturing work could commence. His next step was to design the custom metal parts and build the printed circuit boards to control and drive the game. 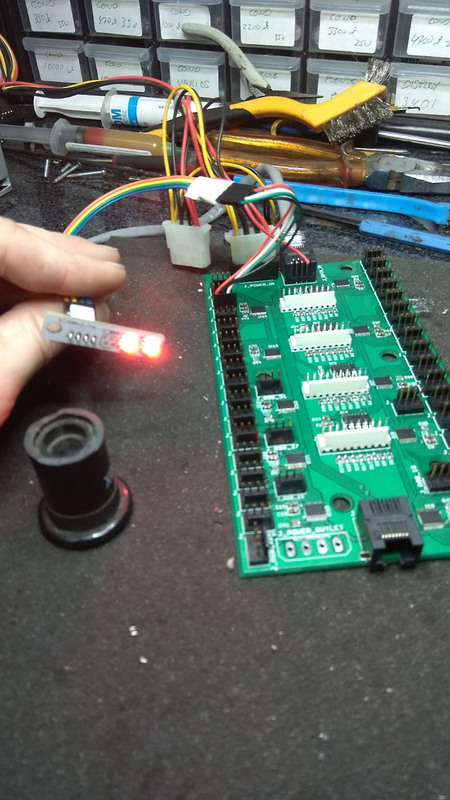 Antonio said this stage was easy for him given his previous design and manufacturing experience with the whole of Captain Nemo, the controller boardset for Zidware’s Magic Girl (for which he said he was never paid), and his on-hold other Quetzal title, while the company he uses to manufacture the metal parts is, he said, very good and always delivers the parts on time. 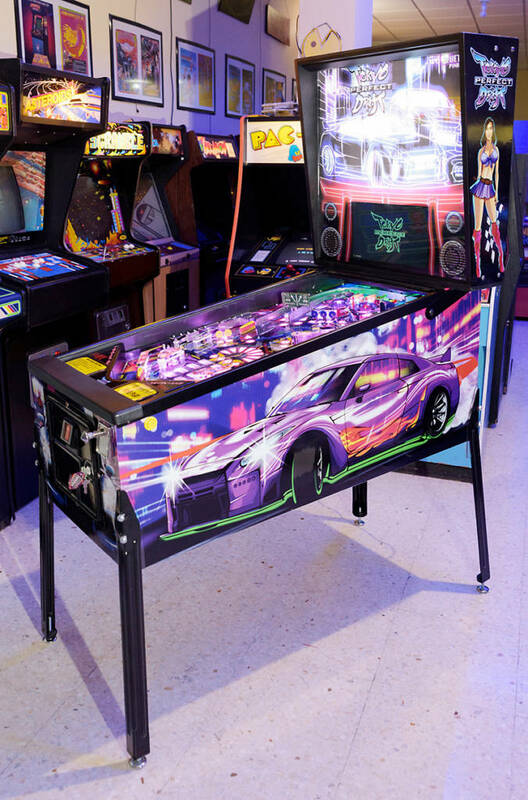 In the meantime, Orlando from STR Pinball prepared the cabinet and Gustavo began the playfield artwork design. Once they had a flip-able game, they discovered how the upper left flipper shot was not as smooth as intended, but with the help of Orlando and Cristina they refined it to make it flow smoothly. 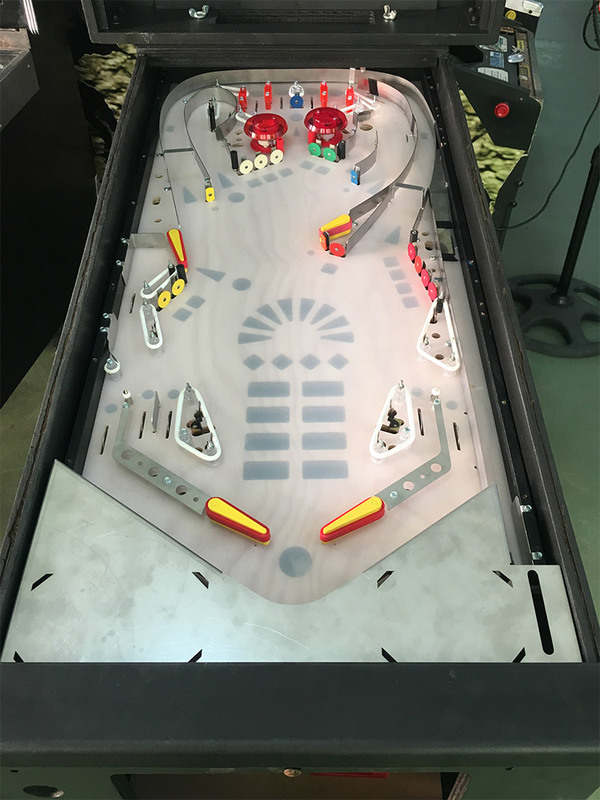 The initial design had changed very little, with just a few small adjustments and some changes Gustavo made to several inserts to make the playfield more aesthetic. 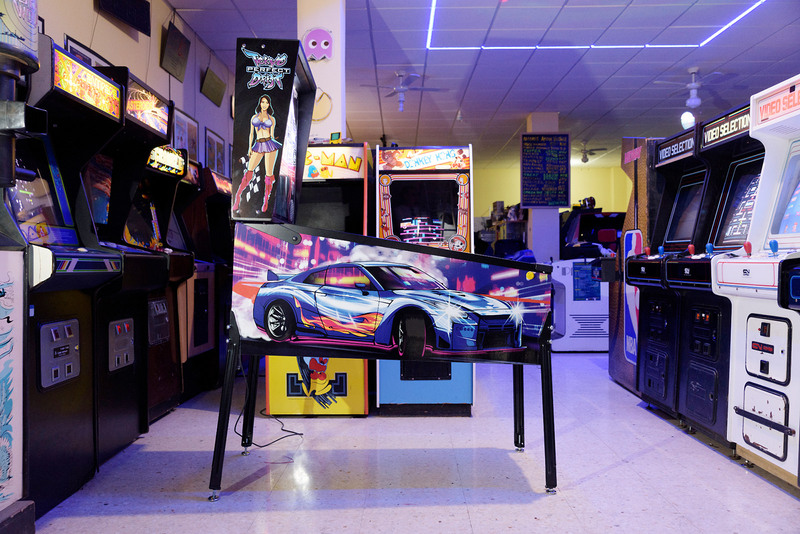 With the game progressing well, the team talked to Jose María Litarte from the Arcade Vintage Association in Petrer and Juan Carlos Durans from Biar Pinball Association about organising a launch in early December. For the launch the game had about 50% of the rules, around 30 display animations, and 2 of the songs (composed by Cristobal Ortuño, Antonio’s brother). Antonio says he will spend the next 3-4 weeks to complete the rules and effects. 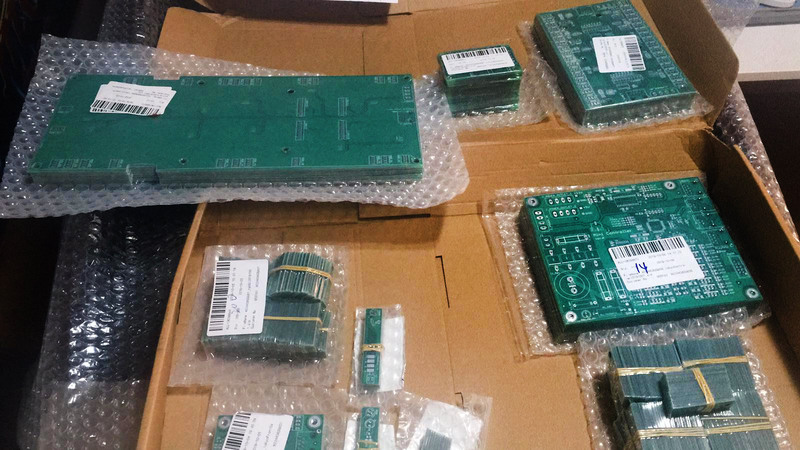 The team have enough cabinets and most of the parts to manufacture six complete games. Beyond that, parts will be ordered and games assembled according to demand with no limit on the number of games produced. Antonio says he expects manufacturing to begin in January, with minimal delays building games beyond those initial six since most parts will be made locally in Spain with the exception of standard off-the-shelf components which will be imported as required. Construction rate will be 2-3 games built per month. The initial price of Tokyo Perfect Drift is €4,395 ($5,000/£3,940) plus tax and shipping. These initial orders will be restricted to US customers of Captain Nemo games, since they had an extended wait for their games to be delivered. After that, general orders will be accepted at a similar but as-yet undetermined price. There are two translite designs and customers can choose which of the two they would like in their game. You can watch some of the TPD gameplay from the launch in these three YouTube videos. 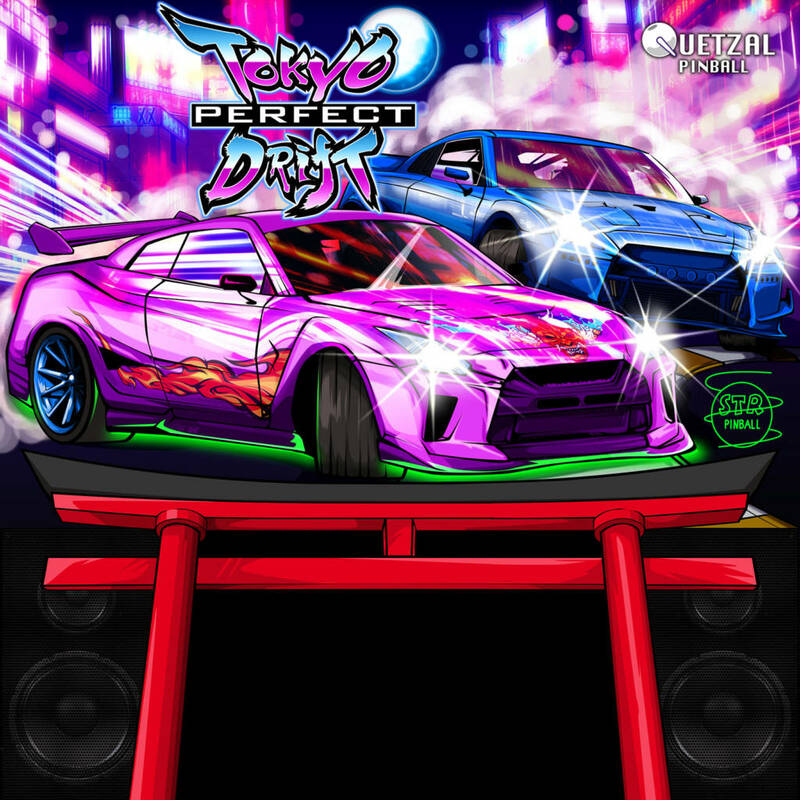 We’ll bring you more news about Tokyo Perfect Drift and how you can order one right here at Pinball News.